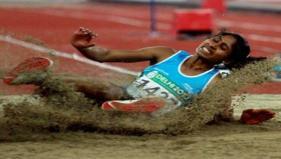 Alice Falaiye (CAN) snatched the Gold medal in the Women's Long Jump from Prajusha Malaikkal (IND) in the final round of the competition at the Jawaharlal Nehru Sports Complex on Sunday. Malaikkal had led with a jump of 6.47m, which admittedly would have been a fairly modest effort to win a Commonwealth Games Gold medal. Not since 1986 has there been a winning distance less than that. Still, five jumpers failed to surpass that leap in the final round - until Falaiye recorded 6.50m with just two athletes left to jump. Malaikkal, Falaiye and thousands of expectant fans held their collective breath while Tabia Charles (CAN) took her final jump. She, too, fell short. Now it was all up to Malaikkal. Her lifetime best is 6.55m and she needed almost every centimetre of that distance to win. But she couldn't do it, meaning Falaiye took the Gold, leaving Malaikkal with the Silver and Charles the Bronze with a best distance of 6.44m.